A 20-round Sample Pack. 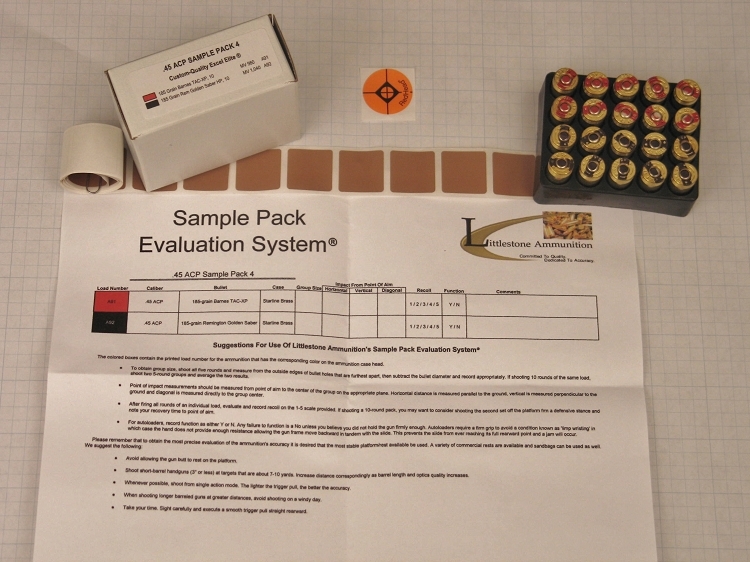 Click On Photos Below Or Image Gallery For Identification Of Other Bullets Loaded In This Sample Pack's Ammunition. Ten rounds of 115-grain Sierra Jacketed Hollow Points. The Sierra jacketed hollow point has the widest opening at the tip of the bullet and a skived Power Jacket that extends to the bullet tip. The large opening and Power Jacket skiving assure unfailing expansion across a wide range of velocities, and all conditions and strike angles. It is designed to provide flawless feeding in all auto-loading pistols, as well as providing especially fast expansion at low to medium velocities. Starline brass cases. Ten rounds of 124-grain Speer Gold Dot hollow points. Gold Dot bullets are bonded hollow point bullets manufactured in three basic steps. First the core receives the bonded jacket; next an oversize hollow point cavity is installed with predetermined expansion folds; and lastly the final cavity shape and volume are set for the optimum performance for the cartridge and intended use. The bonded construction provides exceptional weight retention, which promotes penetration. Starline nickel-plated cases.